We've been looking at the volume of prisms, cylinders and cones this week. I had students working on a project where they had to build one of each with equal heights and widths/diameters. The idea is to explore the volume of each and see how the eventual formulas will relate to one another. Then, Jacob traces can on his paper and cuts out the circle. He cuts a radius and begins rolling the paper (as if he's cut out different sized sectors) to make different cones. He comes up and says, "Mr. Cox, I think the cone that is almost flat has the highest volume because the tighter I roll the paper, the less stuff I can fit in it." Me: What if the circle is flat? What's the volume then? J: There isn't any volume. Me: So then when does the cone go from 'flat' to having the most possible volume? Me: Maybe there's some kind of sweet spot where the volume gets bigger then starts to get smaller. J: Let me think about that. At this point, I was with Jacob. I didn't really know what the volume did as the cone changed. But we were both interested. The next day, Jacob comes in and says, "Mr. Cox, I thought about what you were saying and I think you're right, there has to be some kind of sweet spot." So, we sit down and go to work. Our first bit of trouble came when Jacob said, "I can find the radius of the cone's base, but I'm having trouble getting the height because of this..."
Wish these rulers came with a bubble level. But, we figured out that the Pythagorean Theorem was a nice work around. Now, does our data match the model? It took a while, and thanks to CalcDave for cleaning things up, but this is a pretty cool function. We're estimating the maximum to be about 66 degrees. 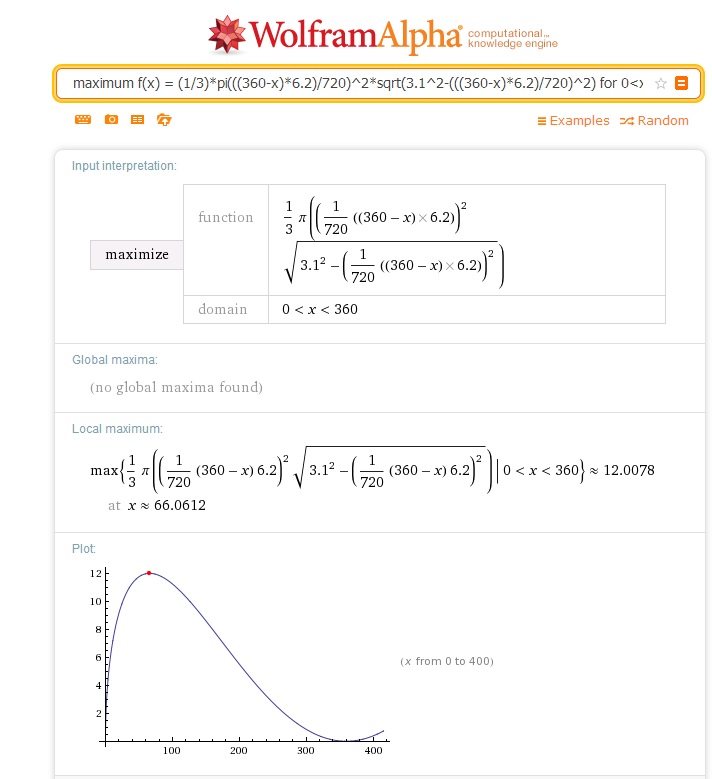 And because my calculus is a little rusty, I'm thankful for the folks at WolframAlpha. This particular function is using a circle with radius = 3.1. The function is a little dense at this point, but Jacob was dialed in as we talked about it. The idea that these crazy expressions really just amounted to Vcone = ⅓πr2h blew him away. It was one of those moments when I was trying to explain something to them and they ended up explaining something to me. We're in the middle of a unit on volume and exploring prisms, cylinders and cones. I was inspired by James Tanton's ability to explain things by getting at their essence. As if to say, "we can call a cylinder a 'cylinder' but it's just a prism made of circles--or a cone can be called a 'cone' but is it really any different than a pyramid?" It was one of those, sitting around a campfire moments. We're using stacks of paper and stacks of CDs to demonstrate why calculating the base area is critical because the rest of the solid is just like a stack of that area and no matter where we slice the solid, we get the same shape--over and over again. Then comes the question about the cone. The base is a circle but when you slice it, you get a...circle? Wait, but it's a different circle. Waitaminit. What about a pyramid? Triangle base and when you slice it, you get a triangle. But a different one. "They're similar. Hey wait, this is a dilation." And the tip of the pyramid is the center of dilation. We did dilations in Unit 1. This was a callback I didn't anticipate: A pyramid is like a 3D representation of a dilation. Thanks, kids. I'd never thought of it that way before. I've applied for one of our district coaching positions. There are still a lot of details to work out, so I'm not quite sure I'm ready to leave the classroom. One thing I am sure of, though, is that I'd like the interview panel (assuming I get an interview) to understand how amazing you all are. I tweeted this form, but I'll leave it here as well. If you have a minute, I'd love your help. Feel free to exclude any information you're not interested in sharing. We're getting some mileage out of this lately. Today, I have a new problem to add to the pile of those that foster the process of hypothesis wrecking. I posed the question with a rubric. Can a unit fraction always be written as the sum of two unique unit fractions? Students played around with a few unit fractions and after a few minutes we had a couple of them. Uh-oh, that doesn't fit the pattern. "Does this example wreck our hypothesis?" This led to a nice conversation on whether this new example and our hypothesis can coexist. It was interesting to see how many students initially thought the hypothesis was wrecked. We tested a few more examples and shared results--all confirming our hypothesis. Then I asked, "So where does this put us on the rubric?" And a student asks, "What has to happen for a 4 to become a 5?" In other words, when does a numeric (quantitative) argument become abstract ? I quickly came up with the question and answers 1, 3, and 4. At lunch I added 2, which really added to the conversation for 6th period. Which answer provides the stronger argument? Most saw 4 as the strongest and agreed 1 was the weakest. But very few saw 2 on the same level as 4. Then one student says, "I see that 2 and 4 are similar but 4 is just kinda strung out." Yep, the kid has a feel for brute force vs. elegance. Love it. By the end, we agreed that 2 and 4 were more abstract and 3 was more quantitative. What about 1? Well, 1 was what they would've considered a great answer a few months ago. This is what prompted my question about SMP 2 on Twitter.